Hybrid Racing Radiator - Dezod Motorsports Inc - Home of the automotive performance enthusiast since 2002. Griffin is well known in the racing industry for their radiators, and their quality is unrivaled. That is why Hybrid Racing has teamed up with Griffin to make a radiator specifically for K series engine swaps. Each K swap radiator is carefully designed by Hybrid Racing to take into account both the chassis’ dimensions and mounting points, as well as the K-series’ motor coolant inlet and outlet. These radiators simplify the K-series engine swap by eliminating the need for custom mounting brackets and by providing a guaranteed fit for your specific swap. That means no cutting is required whatsoever. This radiator integrates the necessary ports for the Coolant Temperature Sending Unit and the Fan Switch, eliminating the need for a Hybrid Racing Radiator Hose Insert. There is also a grounding bung welded to the lower end tank to guarantee that the sensors mounted to the radiator get a good ground connection. 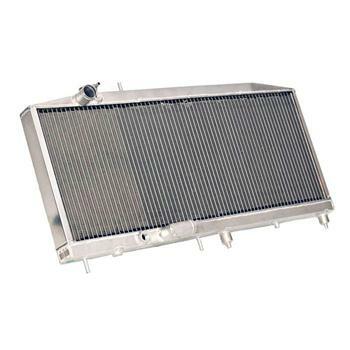 All Hybrid Racing radiators feature all-aluminum construction and high-precision TIG welds. What comes with my radiator? Each radiator is supplied with a draincock and radiator cap. Any hoses, sensors, or fans shown in the pictures above are not included with the radiator. How is this radiator any better than the OEM radiator? This question has several answers. First, the Hybrid Racing K swap radiator features all aluminum, fully tig welded construction. As a result, it’s less likely to leak or break than the OEM unit which uses an aluminum core that’s bonded to plastic end tanks. Second, the Hybrid Racing Kswap radiator’s coolant ports are relocated to allow the use of shorter coolant hoses when used in conjunction with a K series motor. One other distinct advantage of this radiator over an OEM radiator is the larger core size. The thicker core on this radiator translates to an increased cooling capacity and a lower water temperature. No. This radiator is a completely bolt-in part. It mounts to the OEM lower radiator and AC supports. No cutting or bending of the chassis or mounting brackets is required.